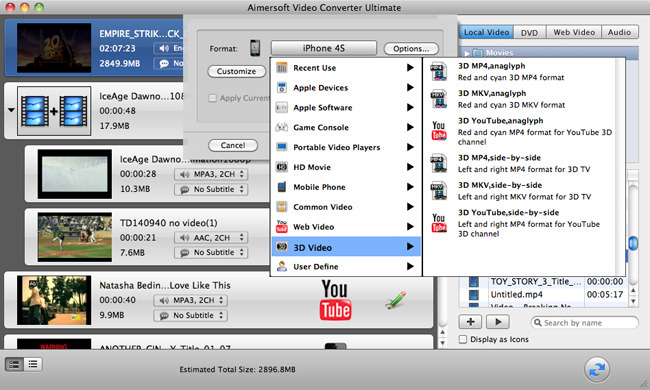 Aimersoft Video Converter Ultimate for Mac is a massive working platform for videos, audios, and DVDs on Mac OS X. It is an all-around solution to satisfy all your multimedia demands like video/audio downloading, converting, transferring or DVD ripping, burning and so on with the preset Video/Audio Converter, DVD Ripper, DVD Burner, Web Video Downloader, and Device Transfer. 4. Save and Transfer media files to any portable devices, including the latest. The integrated Video Downloader will detect all the downloadable videos automatically while they are playing in your web browser. Directly download them with just a hit. Trim video and audio clips, crop frame size, split and merge videos, add effects and set parameters of video brightness, contrast and saturation as you please. Fast to convert all popular videos like AVCHD MTS/M2TS, TS, HD MKV, HD WMV, HD MOV, SD WMV, MP4, AVI, MOV, MPEG, FLV, etc. and audio formats with high quality. Aimersoft Video Converter Ultimate for Mac allows you to rip DVDs to any video and audio formats to your local or for your portable devices for viewing whenever and wherever. Choose Burn DVD as the output option in the main interface and drag the downloaded web videos or your collected video from the local to burn videos to DVD. Simple to copy and backup DVD or DVD files like Video_TS, ISO, and .dvdmedia to a new DVD disc for better saving or easier viewing on home DVD players. All the converted files can be free to save any directory as you wish. And you can you're your works into iMovie, iDVD, Final Cut Pro, iTunes, QuickTime, VLC Player, etc. Convert the video or audio that embarks your favorites or happy memories to every format and then send them to your friends without worrying about the formats. Free to transfer the converted files into portable devices like iPad, iPod Touch 4, iPhone 4, Android Phones, iPod, PSP, Xbox 360, BlackBerry, Smart Phone, etc. Easy to load all your videos, movies, music, and DVD files from your local Mac with the preset Media Browser directly connect with your local media directories. With the three vivid thumbnails for each output options, you can enter the main interface for your needs easily with a single hit. Time is money. With this massive Video Converter, you can convert videos, audios, or rip, copy and burn DVDs within least time. MP4, AVI(XviD), ASF, WMV(Windows Media Video), MPG, MPEG-1, MPEG-2, FLV(Flash Video), 3GP, 3GPP, MOV(QuickTime), MKV , TS (MPEG-2), M4V(without DRM), VOB, TP, TRP, etc. How to convert videos, audios and rip DVD, copy or burn DVD on Mac?